That doesn’t mean they cannot change, but our first family is our template and speaks volumes about who we are and how we communicate our needs. In essence, how we learn to communicate and manage conflict is a ‘dance’ between two people. And sometimes people dance very well together – they have all the communication – verbal and nonverbal down to a science. It simply works. While others, no matter how they try, feel like they are dancing with two left feet. And many couples find it difficult to change the pattern they have created or extricated themselves from them. These patterns of interaction are fostered due to one or both partners’ limitations in effective communication skills, as well as not being able to understand, identify, own, and express their feelings of fear and vulnerability. Often times each person has fears that the relationship will not work out (even if expressed differently), that their partner will not have their back and be available, that they will not feel safe in their relationship and that their safe haven is being jeopardized. These all make people feel equally vulnerable. How do all these factors get played out? 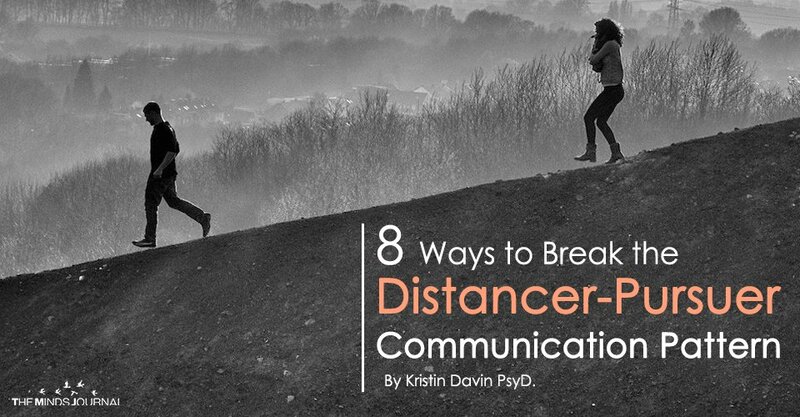 In one of the most common communication patterns: the Distancer-Pursuer relationship. According to John Gottman, Ph.D., Professor Emeritus and chief psychology ‘guru’, the tendency of men to withdraw and women to pursue is wired into our physiological makeup and reflects a basic gender difference. Women tend to be the Pursuer – wanting to engage in communication and continue to try and talk it out – despite the futility at the time. They will do this until their needs are met. Men, on the other hand, tend to be the Distance – they want to flee the argument and run to their man cave. They run (often for the hills!) when they feel pursued. They want to avoid conflict. They also need space and time, a cooling off, time to focus and process. The Pursuer doesn’t see it that way. They certainly don’t feel it that way. They want to connect now and figure it out now. They often become increasingly critical. As you can imagine, this sets up a dynamic that, if not recognized, can get couples stuck in a pattern with little chance of resolving the conflict to a degree that is agreeable to both parties. Every time there is a conflict or a disagreement, they each play out their role, with increased frustration. One partner who is seeking security as a way to assuage their anxiety reaches for the other in their attempt to want more contact. Their partner may feel overwhelmed by this and actually does the opposite of what the other needs – they create space and withdraw to relieve their anxiety. As a result, a pattern of relating is established. And you can imagine, this type of communication style is a major contributor to a marital and relationship breakdown. Unfortunately, many couples who fall into this pattern early in marriage do not make it to their fifth anniversary – while others are wired in it indefinitely!